The previous STIP included funds for widening Highway 160 north of South Tryon Street in 2022 ($15,650,000) and 2023 ($15,650,000). The new STIP includes $31,300,000 for construction in 2022, which suggests the plan is to complete construction in one year rather than two. 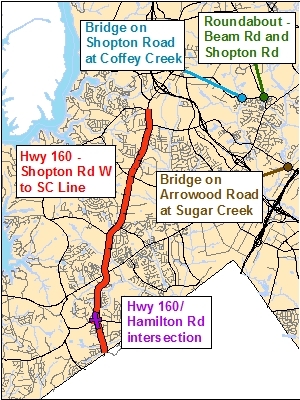 The new plan also includes widening of Highway 160 south of South Tryon Street in 2022 as well as improvements to the Highway 160/Hamilton Road intersection, as described in the updated story below. This bridge was built in 1975 and is considered structurally deficient and functionally obsolete. The STIP calls for $120,000 for right-of-way acquisition in 2020 and $1,200,000 for construction in 2021. This project will convert the existing four-way stop intersection into a single lane roundabout. Improvements will include crosswalks, new sidewalks, planting strips, pedestrian refuge islands, landscaping, street lighting, and bike lanes. The existing intersection creates vehicle delays and congestion. It is also very hard for pedestrians and bicyclists to cross the street. The proposed roundabout will reduce congestion and improve pedestrian and bicyclist crossings. The roundabout will accommodate existing and future vehicular traffic projections and make it easier for bicyclist and pedestrians to cross all legs. The STIP calls for $550,000 for right-of-way acquisition, which is currently underway, and $1,733,000 for construction beginning in fall 2017. The intersection of Shopton and Beam Road will close for approximately four to five weeks, and traffic will be detoured. For more information see Beam Road roundabout at Shopton Road on the City of Charlotte's web site. This bridge was built in 1986. The STIP calls for $270,000 for right-of-way acquisition in 2021 and $2,700,000 for construction in 2022. The STIP also calls for widening I-77 to ten lanes by constructing managed lanes (toll lanes) from I-485 (Exit 1) to I-277/NC 16 (Brookshire Freeway) (exit 11). Right-of-way and utility relocation would begin in 2024 and construction would begin in 2027. Since this project is scheduled to begin after the first five years of the STIP, funding is not considered committed and is subject to reprioritizing. The following story was posted on January 8 and has been updated to show construction for the widening of Highway 160 in 2022 rather than 2022 and 2023. 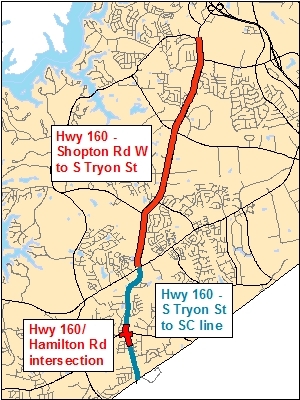 (January 8, 2017) The North Carolina Department of Transportation (NCDOT) released its Draft 2018-2027 Statewide Transportation Improvement Program (STIP) last week, and it includes the widening of Highway 160 (Steele Creek Road) south of South Tryon Street to the South Carolina state line. NCDOT plans to issue the final approved STIP in June 2017. More information on the Draft 2018-2027 STIP is available on the Charlotte Regional Transportation Planning Organization (CRTPO) web site. The latest plan calls for right-of-way purchase and utility relocation in 2020 and construction beginning in 2022. This is the same schedule as the widening of Highway 160 north of South Tryon Street approved two years ago. This means that construction on the entire length of Highway 160 from Shopton Road West to the South Carolina state line is scheduled to begin as one project in 2022. The section south of South Tryon Street was not listed at all in the previous, 2016-2025 STIP, so this is a significant improvement in the priority for Steele Creek Road. Projects scheduled to begin in the first five years of the STIP are considered committed, and not subject to future reprioritization. Thus all Highway 160 projects will be committed once the final STIP is approved later this year. Widen intersection of NC Highway 160 (Steele Creek Road) and Hamilton Road for additional capacity consistent with the future Steele Creek Road cross section. Some turn lanes have been added at this intersection by a developer, and Lennar Homes will be required to make additional improvements to accommodate additional traffic expected to be generated by its new residential development under construction near the intersection of Hamilton Road and Smith Road. This 4.2 mile widening project extends along Steele Creek Road from Shopton Road West to South Tryon Street (NC Highway 49) in Charlotte. Improvements include widening the existing roadway from two (2) lanes to four (4) lanes with a grassy median and installing bike lanes and sidewalks. This 2.2 mile widening project extends along Steele Creek Road from South Tryon Street (NC Highway 49) to the South Carolina state line. Improvements include widening the existing roadway from two (2) lanes to four (4) lanes with a grassy median and installing bike lanes and sidewalks. Developers have provided improvements adjacent to the RiverGate shopping complex. 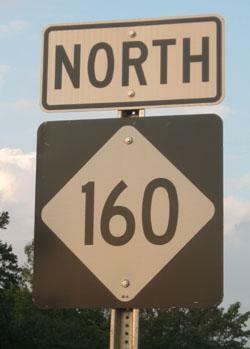 According to the Lake Wylie Pilot, Highway 160 is South Carolina will be widened from two lanes to five from Gold Hill Road to the North Carolina state line. "Right-of-way acquisition should begin in 2016 for the $8.8 million project. The construction at S.C. 160 and Gold Hill Road is being done by SCDOT. Construction on the rest should come in 2017." NCDOT released its draft 2018-2027 Statewide Transportation Improvement Program (STIP) on January 4, 2017. This document summarizes initial projects that have been identified for funding and implementation over the next ten years. Its release is just the beginning of a continued effort over the next several months by CRTPO staff and TCC members to review the projects and assess the information for accuracy. This step also triggers a variety of upcoming public involvement efforts and financial analysis at the local and state levels. NCDOT’s Board of Transportation will adopt the STIP in June, and CRTPO is charged with adopting their local version, known as the 2018-2027 TIP by August 2017. The TIP identifies the region’s allocation of transportation resources among the various capital and operating needs of the area, based on a clear set of short-term transportation priorities. It also identifies the strategies that CRTPO and NCDOT plan to undertake to implement the projects within this ten-year timeframe. To view the draft 2018-2027 STIP, visit http://crtpo.org/plans-programs/transporation-improvement-program. Robert Cook, Secretary of CRTPO, will be one of the speakers at the 2017 Steele Creek Residents Association annual meeting and will give an update on the prioritization of Highway 160 projects. Stuart Basham, NCDOT Division 10 Planning Engineer, and other NCDOT staff also will be at the meeting to answer questions about highway improvement and maintenance projects. The Steele Creek Residents Association meeting will be on Thursday, February 23 beginning at 6:30 PM at Christ the King Church (13501 South Tryon Street).